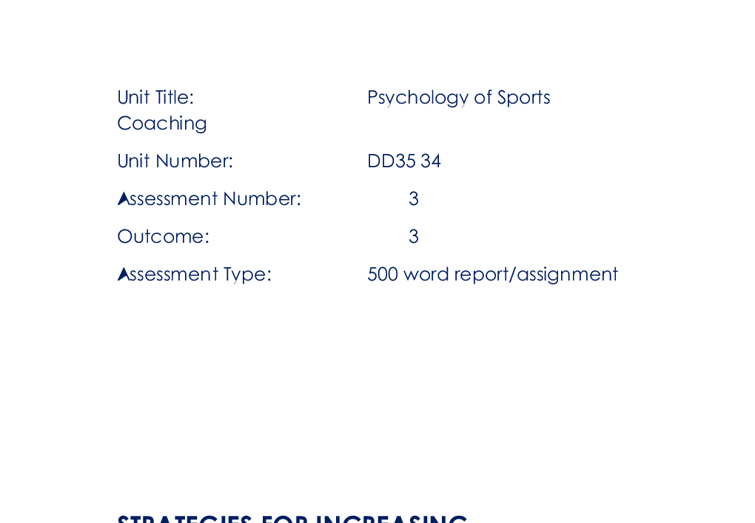 Unit Title: Psychology of Sports Coaching Unit Number: DD35 34 Assessment Number: 3 Outcome: 3 Assessment Type: 500 word report/assignment STRATEGIES FOR INCREASING PARTICIPATION AND MOTIVATION Stipulated Date:___________________________________________ Date Handed in:___________________________________________ MOTIVES FOR PARTICIPATION IN SPORT 2 common factors for this is Achievement and Friendship Achievement Most participants that take part in sport do it for the achievement side of things so they can get recognition for the hard work they put in to achieve a goal. This could be simple or complex achievements. For example, if the participant is not that good at a certain sport, if they work hard and see they are improving or even getting a mention from the coach they get a sense of self achievement because they have been noticed and know the hard work they have put in has paid off. ...read more. Fitness Most people participate in sport or sports for fitness reasons and less go for ego or to be popular. Most motives for adult participants are they want to stay in shape, get physically fit and to get exercise. ENHANCING MOTIVATION 2 methods to enhance motivation is by The use of role models and Goal Setting Use of Role Models A method of enhancing motivation is by using role models such as a team captain or if your group of participants are younger you could ask a first team player to come to a training session to watch your players, by doing this the individuals will be motivated in order to impress the first team player and also just because the first team player is at their training session. ...read more. This research was in Smith&Smoll, 1997. Reinforcement is done in loads of ways. Reinforcement can be as simple as praise, smile, pat on the back or the coach giving the performer a mention when the group is together. Also, playing a game rather than doing drills or taking a trip to play another team Punishment Punishment controls a lot of aspects of a performer's outcome both inside sport and out. Coaches believe that if you punish a participant for a mistake then you will be able to remove the common mistakes from the performers. This works because if the performer has a fear of making a mistake they will try harder not to make them. Reference 1. Foundations of sport and exercise psychology. (Weinberg and Gould) 2. Peak performance online ...read more. This student written piece of work is one of many that can be found in our GCSE Psychology section. Discuss one or more theories of Moral Understanding and evaluate its conclusions.